A dance highlight this weekend is a new production of "Orpheus and Euridice," a collaboration between Minnesota Dance Theater and Nautilus Music-Theater. 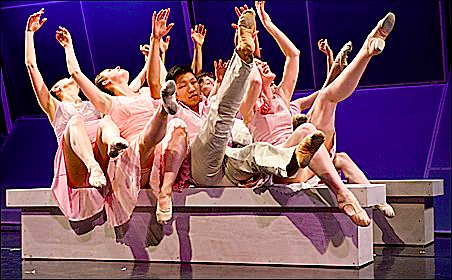 MDT, a contemporary ballet company created in 1962 by the late Loyce Houlton, is always up to something new. This weekend the troupe's integration of music and dance continues on stage. The opening-night performance last Thursday was a tad stilted and under-rehearsed on the part of the dancers. The star of the performance was vocalist Norah Long, who often moved with the dancers as she sang and gave composer Ricky Ian Gordon's score a captivating embodiment (through her facial and bodily expressions) and a sweet, then searing treatment through her spectacular voice. In contrast, the movement was lovely, lilting and somewhat expressive: pitched to the tone of careful and tender, it became monotonous to watch. After the opening performance, Gordon reported to me, via email, that the dancers have improved. "By their opening night, it was almost as if it were the first time they were putting the piece together!" he wrote. "It took doing it once for them to understand, and I mean ESPECIALLY the dancers, the story they were telling. "For example, when they all enter the 'house' during the section which is called 'home,' understanding their role as visitors and playing parts, they were suddenly HEARING the text and responding accordingly. The second night, when Euridice [Melanie Verna] was placed on a platform, and Orpheus [Samuel Feipel] had his solo during 'Song,' they both started to cry. That was my intention, in terms of Act 1 being about 'The birth of love'... it was one of the most beautiful things I have ever seen." Such enthusiasm almost makes me want to see the performance again. But on the other hand, MDT and Nautilus should know that they need to have their act together by opening night. Maybe it's time for dance companies to have preview runs, although I'm sure that's financially prohibitive.